Welcome to Terpening Terrace Retirement. The comfort of home with the luxury you deserve. The origins of a place tell a great deal about what that place stands for. Back in 1944, 50 Ruby Avenue was home to the Terpening family. Bill Terpening grew up on this property filled with fruit orchards, a rose garden, and a manicured lawn. Bill says, “As my folks created a showplace here in Eugene years ago, we have created a place that will be a credit to the community.” The Terpenings, along with the other founders, built this community on the values of family, community, and elegance. To this day, we are still independently owned by those same people. 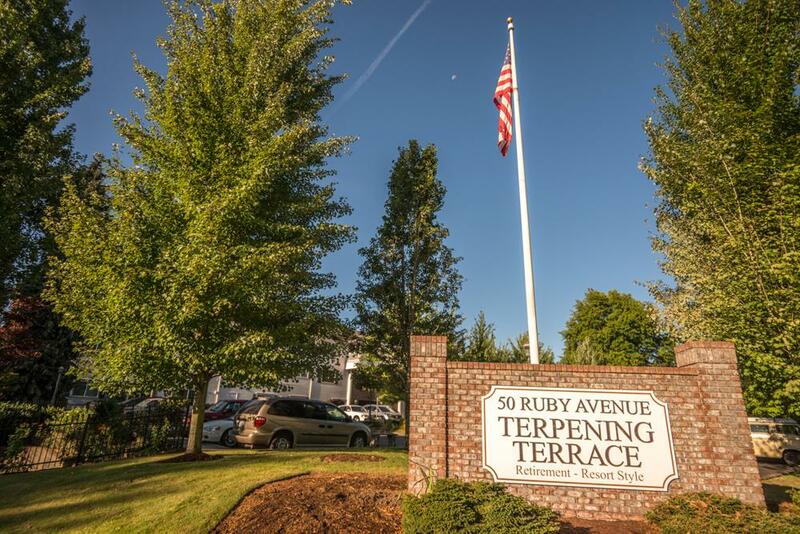 Terpening Terrace believes that a retirement community means the freedom to indulge, security in your independence, and most importantly, maintaining that feeling of home. What does home mean to Terpening Terrace? Elegance. From our newly remodeled, spacious apartments to our resort-style amenities, we take pride in our exacting attention to detail. Great Food. We offer open fine dining with an extensive gourmet menu—eat what you want and when you want, just like home. Family. Our staff treats Terpening Terrace residents like family. Find comfort in seeing the same faces every day that you know and trust. We are independently owned and our General Manager, Kim Stokes, has been with us since the beginning, 17 years ago. Community. Our apartments are luxurious, but we know choosing a home is more than that—it’s about finding a safe and enriching community. Discover an environment that nurtures activity, growth, and connection. With virtually unlimited retirement communities to choose from, you’ll feel refreshed to find one that stands head and shoulders above the rest. We warmly invite you to discover the very best in resort-style retirement living. Reach out to us today to schedule a tour of Terpening Terrace.